Editor’s note: This commentary is by Adam Greshin, Vermont Commissioner of Finance & Management. Gov. Phil Scott believes we can make our education system the very best in the country, if we have the courage to rethink the current system, which is diverting valuable budget dollars away from kids and increasing the tax burden at an unsustainable rate. 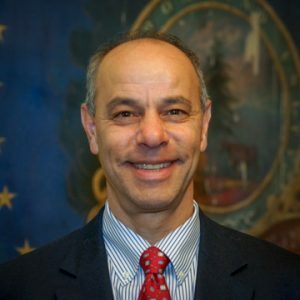 Adam Greshin is the Vermont Commissioner of Finance & Management. Third, a statewide healthcare contract for school employees would be beneficial for employees and taxpayers. The patchwork of locally negotiated healthcare arrangements has driven up premium costs and created major problems in administering the plans. The teachers’ union previously insisted on these locally negotiated arrangements, but we’re encouraged they now recognize a statewide framework is a more responsible path forward. Fourth, we cannot continue to ignore growing inequity in our system. Currently there is a concerning disparity in per pupil spending between districts, and the mechanics of the Education Fund mean low spending districts are subsidizing high spending districts. The plan mitigates this by lowering existing Excess Spending Thresholds (EST) over five years. This will encourage high spenders to slow growth or require them to pay a little more in their local tax rate to avoid shifting their costs to other districts. A major part of the state surplus was obtained by eliminating and limiting deductions and by shifting the tax base from federal taxable income to federal adjusted gross income (a much larger base). A lot more income taxes are being raised from higher income households (TAXING THE RICH), especially with those households selling stocks and paying capital gains taxes; so-called “PENNIES FROM HEAVEN” according to Margolis. – Make the near-zero, real-growth Vermont economy grow. – Pay lots of taxes. The “pennies from heaven” money should be returned to the people as TAX REBATES, otherwise it would just be frittered away to fill various budget gaps, and implement Dem/Prog “priorities” for favored constituencies to get more votes. Shutting down the government would save about $150 million per month. Vermont could use THAT money to pay down debts. The voters of Vermont elected Scott by a landslide. His promise was no new taxes, fees and surcharges. He would be stupid to renege on that. Bush 1 promised no new taxes and reneged and did not get a second term. Whereas Scott’s promise is unacceptable to some, it is acceptable to the vast majority of voters, who will again re-elect him by a landslide. The current $1.7 b for education is a disgrace. It should be cut by about $500 million to be near the US average, to match the dismal Vermont education outcomes. The Dems/Progs seem not able to stop meddling in the education sector, and in the healthcare and energy sectors. The purpose is vote getting. Like Welch’s vote-getting grandstanding at the border in favor of illegal immigration. The mantra of the Dem/Progs is: Spread the government benefits and reap the votes. All these shenanigans are reducing the standard of living of Vermonters. That is the main reason Vermont has such a low rate of economic growth, and why it is losing population, and why it is not attracting businesses into the state, and why so many businesses are leaving. The Dem/Progs know “government enterprise” (socialism), but they refuse to lift a finger tor the private sector, but milk it to the hilt to cripple it. During the 28 years that I taught at Burlington High, there was a sharp increase in the number of administrators. When I first worked there in 1966, we had one superintendent and one assistant superintendent, and about 2500 kids. After Colchester built their own high school, our student population dropped to about 1500, if I recall correctly, and shrank after that. Yet when I retired, we had a Superintendent, an assistant superintendent, a superintendent for sports, a superintendent for transportation, a superintendent for curriculum, a superintendent for buildings and grounds etc. The school board had allowed some “empire builders” to get into leadership positions and that was the result. I served six years as chair of the Board of Listers in Bolton, and it is my firm opinion that taxing by “fair market value” is antiquated and destructive. It basically taxes folks on what they could get for their property if they sold it, and often forces them to do just that. Taxes should be based on ability to pay. A friend of mine, a widow, is currently being hounded for property taxes she can not pay and threatened with having her home, where she has lived for almost 50 years, being sold by the town. Part of the problem is that in my experience, many school board members know little to nothing about education. As a lister, I attended courses about how to list property. At the same time I saw the courses being given for school board members and they seemed to be mainly about how to negotiate with teachers about salaries. During the years when Burlington schools were hiring all those extra superintendents, they were trying to cut teachers salaries. Somehow, that doesn’t make much sense. Indeed, “…propose a multi-year solution that uses bipartisan ideas…set the record straight”. 1st: “…fully fund school budgets”. 2nd: “…transition… to the lowest ratio in the country (about five students to every adult)”. 3rd: “…a statewide healthcare contract for school employees”. The 4th point, while spot on, specifies no solutions. School district boards have figured out they can increase the State’s education payments to their districts by increasing their own spending which concurrently increases the State’s education property taxes across the board. Districts are also incentivized to increase Special Education spending in the same way because most SPED costs are reimbursed. This 4th point is the embodiment of the flaw in a State education monopoly (i.e. socialism). Unfortunately, there isn’t anything new, entrepreneurial or innovative in any of these points. It’s more of the ‘good cop bad cop’ ruse perpetuating Vermont’s education monopoly. “Fortunately, with $55 million in surplus revenue, we can easily…..” …spend it.